We got back to Malaysia at the end of April and had one more month left before our flight home. We decided to take the kids on a beach holiday and I also wanted to fit in one more diving trip. Pulau Redang is an archipelago of 9 islands 12 miles off the east coast of Malaysia. The entire place is a marine park and it’s famous locally for fine beaches, clear water and excellent snorkelling. It’s not really on the international tourist circuit and is mainly visited by local tourists. There’s around a dozen resorts catering to different budget levels. There’s no roads on the island, just paths, so there’s not a lot to do beyond whatever is offered by the resort. We flew to Kuala Terengganu with AirAsia and then transfered to a speedboat which took us out. Jenny’s parents came with us. We stayed at Redang Kalong mainly because we knew one of the owners. It’s not fancy but comfortable and more importantly, it has the best diving operation on the island. Besides diving and snorkelling, there’s kayaking, karaoke and a wide range of games. The crowd is pretty young. As part of the package, you get four meals a day all inclusive and two boat trips to a variety of snorkelling destinations. All you need to do is rent your snorkelling equipment and wait for the boat to leave. I’m very pleased to report that both our kids took to snorkelling well. R* wasn’t keen on getting into deep water but overcame that fear. 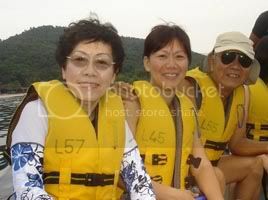 It helped that we all wore lifejackets. K* took a little while to get used to the mask and snorkel but was soon swimming around. You’re not allowed to use fins as a precaution against people walking on the corals. The boat provides a few loaves of bread that get shared by everyone on board. 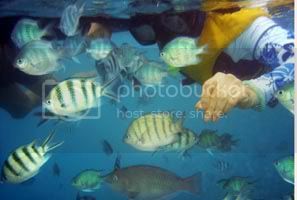 You take the bread into the water and you quickly get engulfed by reef fish in a feeding frenzy. It was a great experience for the kids. They got a good idea of what we see when we go diving. Snorkelling isn’t the first thing you might consider doing with your elderly in-laws but they’re good sports and gave it a go. We almost killed Jenny’s Dad. After a long swim, we were called to the boat which required a long swim to shore. By the time we got there Jenny’s Dad was having trouble breathing and need help to get out of the water. I had visions of us needing an air ambulance but he recovered all right. 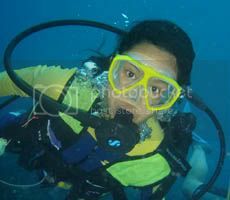 R* was confident enough that on our third day, she signed up for a one day PADI Discover Scuba course. Jenny’s parents looked after K*. R* did the course. Jenny and I went diving. The first dive at Che Isa wasn’t too interesting but the second dive at Pulau Kerengga was good. For our third dive, we joined R* for her very first open water dive out at Pulau Lima South Point. She was very cool and had no problems do a backwards roll and descending with us to 10m. We even saw a turtle! She later admitted that the only way she managed was by not thinking about anything and just doing what she was told. The diving at Pulua Lima was superb with excellent hard and soft corals and plenty of reef fish. We even saw a massive stingray. The only downside was the visibility of 6m was rather poor. Our package of 4 days and 3 nights was just long enough. It’s best to go during the weekdays outside of school holidays. Highly recommended.